We are going to discuss what a lot of folks feel is the most difficult piece of meat in the barbecue world.. brisket. I will admit that it's not for the faint of heart but with a few tips and tricks you should be able to turn out something pretty decent and it's all about patience, low heat and lots of TLC! Sometimes you read stories from the past and you're not sure if it's just something passed down with a lot of stuff added to make it more exciting or if it's absolutely true but rumor has it that years ago, the brisket was a throw-away piece of meat until one day, someone accidentally discovered that it became tender after a very long time in low heat and a tradition was born.. that's the short version. 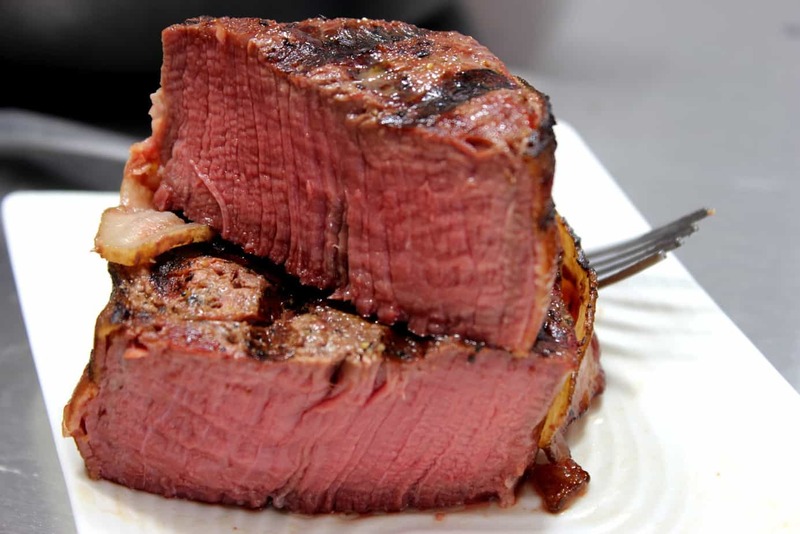 True story or not, I can tell you that this is one of the toughest pieces of meat that you will ever purchase but true to the story, give it plenty of time over low heat and it will slowly but surely tenderize and if you're lucky, it might even be a bit juicy as well! Normally briskets are cooked at night since this is usually what is required in order for them to be done for one of the daytime meals thus the term was born “all night brisket smoke”. Due to scheduling issues, I started this 13 pound beauty at around 11 o' clock in the morning thinking it should be done sometime early the next morning or before. In comes a gusty north wind that evening. The temperature went from 70 degrees to around 40 in a matter of 30 minutes with windchill factors in the single digits and what should have been a 18-20 hour cook turned into 25. Remember what I said about patience.. well mine wore a little thin but I persevered and it was so worth it in the end. 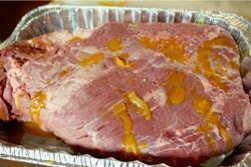 Remove the brisket from it's packaging and rinse it off under cold water. 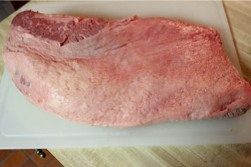 Lay the brisket fat side up on a large cutting board or other suitable work surface. Look carefully at the fat cap and notice any areas that are thicker than 1/4 inch. You may have to cut down into the fat to see how thick it is. I like to trim the fat from the brisket leaving only 1/8 to 1/4 inch of fat on the top. Normally the fat would be tossed out but you will want to save it this time since we will be using it later. Place all of that fat in a ziploc bag and throw it in the fridge.. 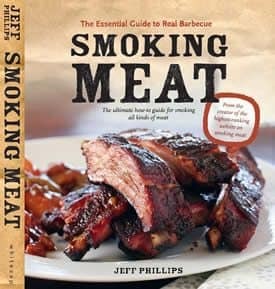 I'll show you how to use it during the smoking process. Flip the brisket over to fat side down. Melt the butter in the microwave for about 30 seconds then add ground rub and stir to mix. Use an injector to inject the butter/rub mixture into the brisket. Insert the needle into the meat at a 45 degree angle all the way in then back off a little before depressing the plunger. Stir the mixture often to keep it from settling and keep adding mixture in each puncture until it starts seeping out. Move to a new spot about 2 inches away and repeat until you've completely covered the entire brisket. 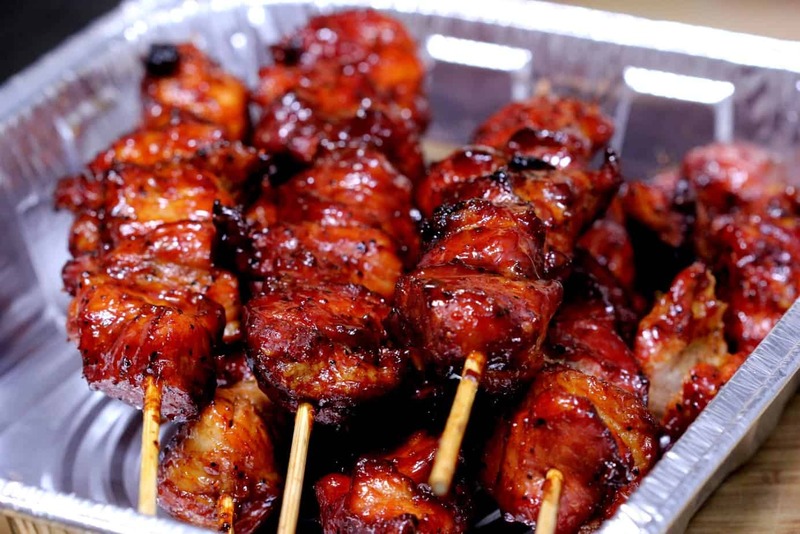 There is no right or wrong way to do this, as long as the mixture is getting down into the meat. Tip: I recommend injecting the butter/rub mixture into the brisket about 12 hours before you plan to smoke it. This allows the butter to “set up” and will keep it from seeping out so quickly once it goes into the heat. 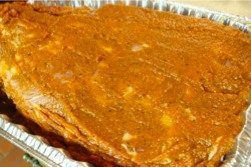 Place the brisket in a large pan or container during injecting to contain any drips or runoff. 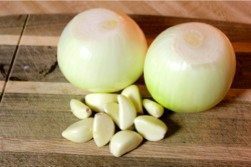 Place (2) quartered medium onions and (10) garlic cloves in a food processor or blender with (6) heaping tablespoons of Jeff's rub (purchase recipe here). Run processor until mixture becomes a puree and everything is fairly smooth. 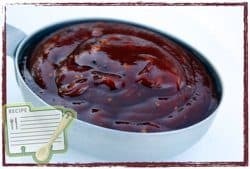 Place the brisket fat side down in a large pan or container (if it's not already) and pour the seasoned onion marinade over the brisket spreading it out with a spoon to make sure it covers the top and sides of the meat. 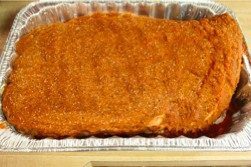 Cover the container with foil, plastic or fitted lid and place in the fridge for at least 12 hours to allow the marinade to do it's job on the brisket. After 12+ hours of marinading, remove the brisket from the fridge and set it on the counter top. Remove the covering and sprinkle a little more of Jeff's rub (purchase recipe here) on the top of the brisket for good measure. Leave the brisket sitting to come up to temperature a little while you go get the smoker ready. 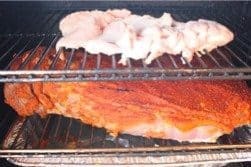 Regardless of what kind of smoker you are using, do whatever it takes to get the smoker to maintain about 225 with plenty of smoke flowing for at least 6-8 hours. I used the Great Outdoors Smoky Mountain smoker (Big Block) now made by Landmann for this cook so it was just a matter of making sure I had plenty of propane, filling the water pan and placing about 6 large chunks of hickory in the wood box filled in with wood chips to completely fill up the box. This will create smoke for about 2 hours before I have to repeat the process. I did not put the wood box in the smoker just yet. I let the smoker run on high for about 30 minutes to get the metal good and hot before adding the brisket. This would also steam the racks and allow me to give them a good cleaning with a brush and some paper towels before putting the brisket on. The steam really helps to soften the grease on the racks so that it can be easily cleaned off. I usually do this when I am done cooking but another quick cleaning before putting the meat on ensures that it's completely sanitary and I'm keeping my family and friends safe. 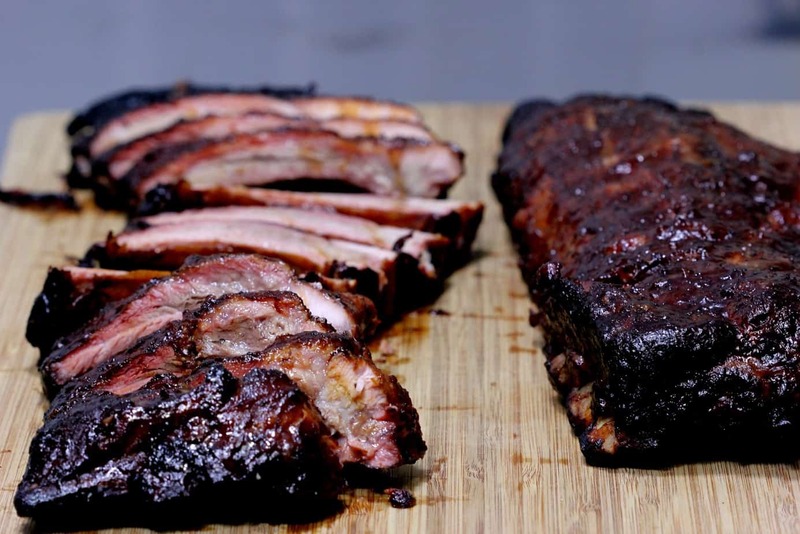 Once the smoker is clean, holding a steady temperature of about 300 degrees and ready for the brisket, place the wood box in the smoker and go get the brisket. 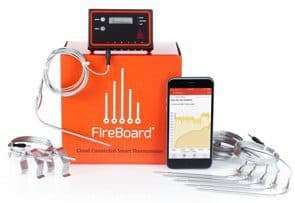 It will take about 5 minutes before you see any smoke so this gives you time to get the brisket on without having a bunch of smoke in your eyes. 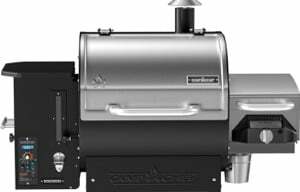 Note: This setup is for the Great Outdoors Smoky Mountain gas smoker but you can do this on other smokers as well that has multiple racks. You might have to get a little creative on smokers that only have single or double racks to replicate my setup. 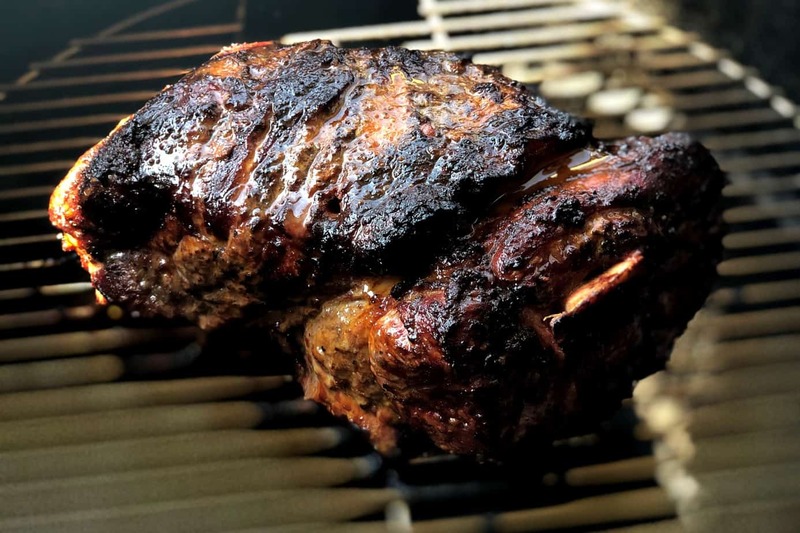 Place the brisket on a center rack with a large pan on a rack just below it to catch some of the juices. 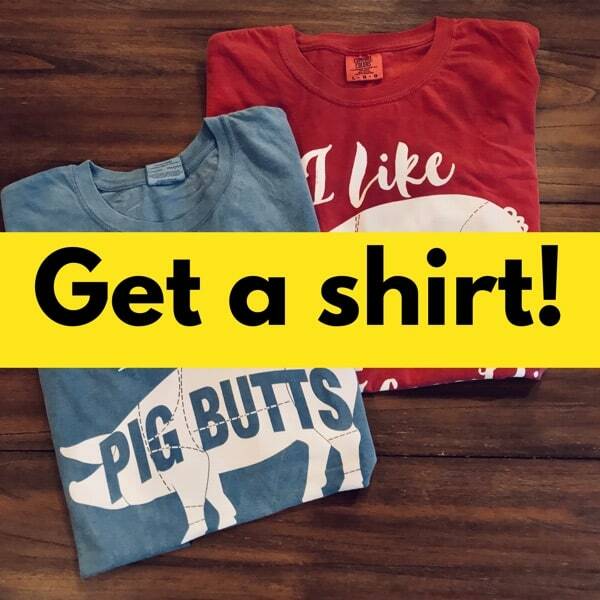 Remember that fat that we saved? 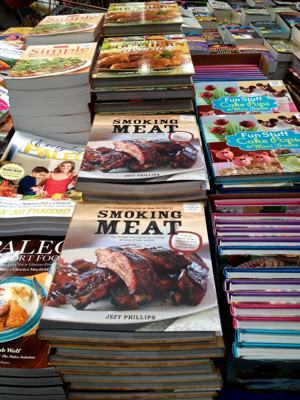 Place it carefully on the rack just above the brisket. It will render and drip tasty juices all over the brisket while it cooks so you won't feel the need to open the door and baste the meat. I usually place the brisket fat side up but since I have fat above it to drip down on the meat and a pan below to catch the extra juices not to mention the tasty onion marinade that we did NOT wash off.. we are putting this brisket fat side down just like it comes out of the container or pan. As you can see in the picture, the brisket is directly on the grate for maximum smoke exposure. 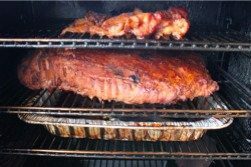 For non-wood burning smokers, I usually recommend that you apply smoke for about half of the estimated cook time. This 13 lb. 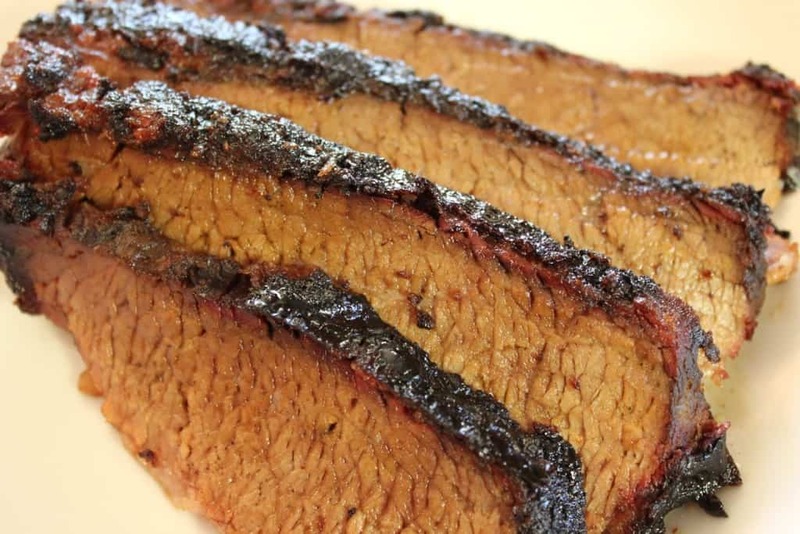 brisket is estimated at 1.5 hours per pound or about 20 hours. so I am going to add good hickory smoke for 10 hours. 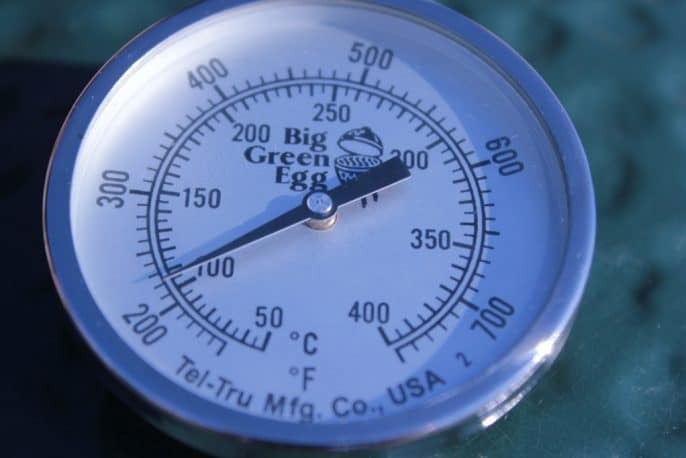 Just as soon as you place the brisket on and shut the door, let the smoker come up to about 200 degrees then turn the heat down to medium to let it creep up to 225 or so. Don't the heat get above 235-240 to prevent the rub from burning. Here is the brisket at the 5 hour mark.. looking very good. Note: I poured a can of beef broth (about 16 ounces) into the pan at this point to keep the drippings in the pan from burning. Open the door only to replace the wood chips and after 8-10 hours of smoke, leave the door closed only opening it to add water to the water pan. 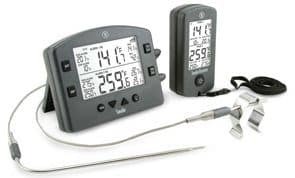 Be sure to use a digital probe meat thermometer to keep you informed of the temperature of the meat. This does not have to be inserted at the very beginning of the cook time but it should be inserted sometime in the first 4-6 hours before the juices start flowing inside the brisket. If you insert a probe while the brisket is really hot, the juices will squirt out and you lose valuable moisture that needs to stay inside the meat. After the meat reaches about 165 degrees F, you have a few options. you can wrap it in foil to speed up the cooking process and help to keep the moisture inside the brisket while it cooks. This will soften the outside of the brisket and mess up the crusty outside bark that most folks love. To me it's worth it but it might be a deal breaker for some of you. Place the brisket down in the pan with the juices. The brisket will act as a sponge and soak up some of the juices while it cooks giving you a more juicy piece of meat. To get the best of both worlds.. (option 2 + option 3) place some foil over the top of the pan to seal it off while it finishes cooking. This will also mess up the bark on the outside just like option 2 but I think it's worth it sometimes. No matter which option you choose, cook the brisket until it reaches at least 185 degrees. I usually let it go all the way to 195 degrees but that's me. The brisket will be very dark when it's done but it should not be burnt if you kept the temperature in check. 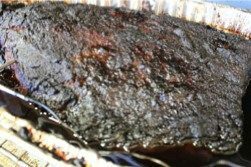 Q: Why cook things like brisket so long and to such a high temperature when it is safe to eat at a much lower temperature? A: Unlike more tender cuts of beef like sirloin and prime rib, brisket is safe to eat at much lower temperatures but it is still tough as leather at that point. 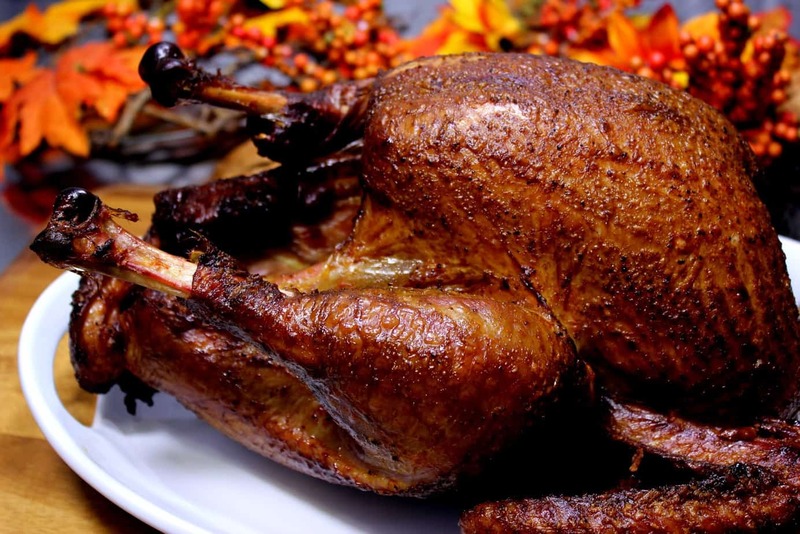 It must be cooked to extremely high temperatures in order to become tender and reach it's full potential. Once the brisket is done cooking and it has reached it's perfect temperature, remove it from the smoker and set it on the counter to rest for about 30 minutes before slicing. This allows the juices in the meat to redistribute and to settle down a little so they want squirt out as bad when you cut into it. Once the meat is rested and ready to slice, make a small cut on the thinner end (the point) to figure out which way the grain runs. Slice the brisket across the grain to accentuate the tenderness of the meat. 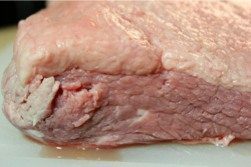 If the meat is falling apart tender, cut the slices thicker or if it is not as tender as you had hoped, cut the slices a little thinner to compensate. Slice the brisket then lay the slices overlapping each other into a serving tray or pan with slightly raised edges. Defat some of the juices from the pan and spoon some of the juice over the slices just before serving. You can also serve each person a small bowl of the juices to use on their own or even as a dip for their bread. 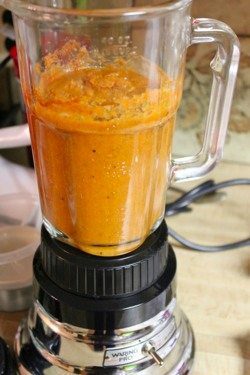 Pour the juices from the pan into a jar or tall slender container and place it in the fridge for about an hour or in the freezer for 20 minutes or so if you are in a hurry. Once the fat becomes solid on top, it can be dipped out and discarded. The juices that are left are defatted and ready to use as a dip or a way to juice up the brisket. 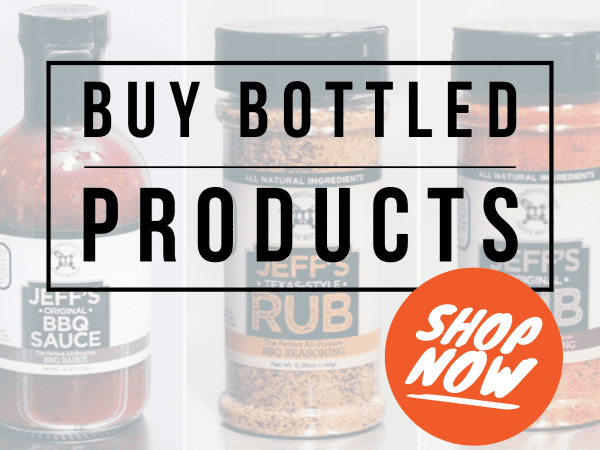 Add a few tablespoons of my rub (purchase recipes here) to add more flavor. Didn't Catch the Juice? No Problem! Mix well and pour over brisket slices, mix in wtih chopped brisket or serve as a dipping sauce. 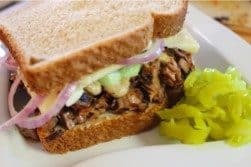 I just had to have a sandwich using some of the brisket.. tasty meets OMG! 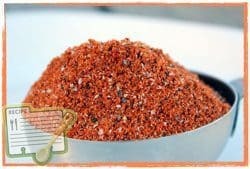 I recommend using a low-salt rub, I use my own, and that is plenty of salt for the brisket. If you aren’t using a rub then a basic salt and pepper rub will work but I recommend that you go easy on the salt. You can always add salt after it’s done cooking if it needs it. I did a 7# brisket a 225 for 10 hours in a Masterbuilt. outside temo was 45-55 overnight and my remote stayed constant at 225. I have 2 probes in the brisket and at hour 9 my meat temp was 205. Is that too high or just better for pulling rather than slicing? at hour nine I wrapped in foil and basted one last time and back in the smoker for the last hour. any thoughts or suggestions> it does look awesome. let you kno how it tastes shortly! !